It’s no secret that the affluent have money to spend on shiny items. Some of those shiny items come with hefty price tags, too. 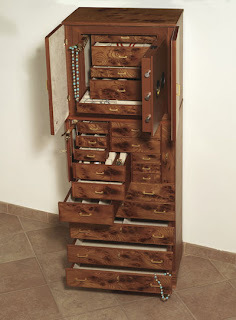 If you have a special lady friend who happens to be having a birthday soon, or if you want to start saving up for the big Christmas gift, then I am sure she would be happy with an Agresti Armoire. Handcrafted from elm trees indigenous to Italy, these beautiful standing armoires have safes inside to lock valuables away, and better yet, are anchorable to the wall. Thieves will have a hard time trying to walk away with your shiny jewelry. At a price tag of $8,000-10,000, you will definitely be getting a luxuries item with some great peace of mind.